38880 CSM110.jpg 500X638\CSM110.jpg 38881 CSM110_1.jpg 500X638\CSM110_1.jpg 38882 CSM110_2.jpg 500X638\CSM110_2.jpg 38884 CSM110_4.jpg 500X638\CSM110_4.jpg 38879 CSM110_7.jpg 500X638\CSM110_7.jpg Send A Hint! 'Top up the blue magic with this unique cake! 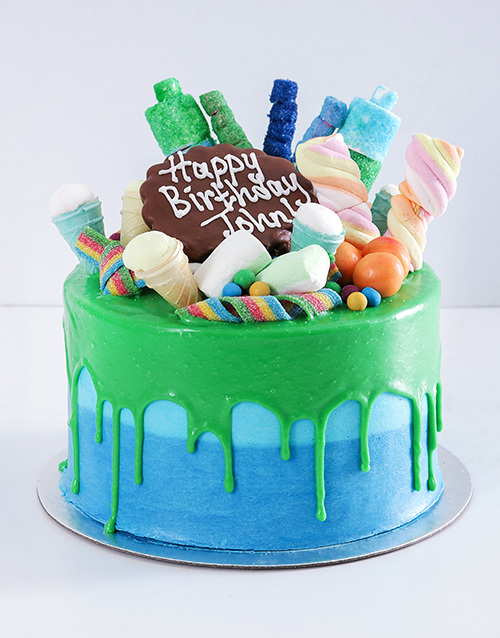 It consists of layers of white and blue coloured vanilla sponge with vanilla icing in between, which are then iced with coloured vanilla icing and green coloured white chocololate ganache. The cake is decorated with mallows and sugar sweets, and then finished with a chocolate dipped vanilla cookie with your personalised message. Presented in a luxury keepsake box, it will certainly be enjoyed by all! Allergens:wheat, gluten, cow's milk, nuts, egg and dairy. All our products are Halaal. Get this Personalised Blue Magic Drip Cake delivered with NetFlorist.